As I was researching circuit preachers for a minor story thread in one of my books I came across an interesting little rabbit trail I couldn't resist pursuing. The tidbit referenced a very unique tool utilized by clergy and other missionary-minded folk who were attempting to do their own brand of ‘taming the west’ - namely Chapel Cars. These utilitarian traveling churches were constructed inside modified railroad cars. They rode the rails from town to town, parking on sidings for as long as they were needed, then moving on to the next stop. Space was set aside for very modest living quarters for the missionary and perhaps his wife. The rest of the space was utilized for church services. They were furnished with pews, a lectern, an altar table and in some cases an organ. Depending on size and construction, they could accommodate 70+ people. The Chapel Car served as a home, church, Sunday School, social hall, library and meeting place. They carried bibles and tracts to be distributed all along the lines. The missionary and his wife, in addition to their usual ministerial duties, were expected to function as singer, musician, janitor and cook. They helped organize permanent churches, including raising the necessary funds and helping to construct the buildings. The idea of the chapel card was not original to the U.S - they had existed in Europe for some time. 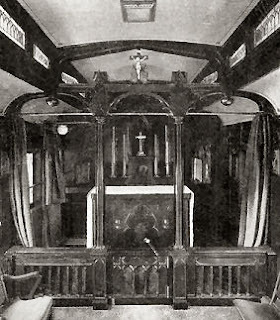 The first Chapel Car in the America was commissioned by Reverend William Walker, the Missionary Bishop of North Dakota. The task of ministering to the people in such a vast and sparsely populated territory was a daunting one. That, and the fact that many towns didn’t have the funds, or any certainty of permanence, to invest in a building, and it seemed a better solution had to be found. Having knowledge of the chapel cars used in England, Bishop Walker decided that would be a workable solution to his challenge. These Chapel Cars traveled throughout the West and Midwest. They visited mining towns and logging camps, tent cities and fledgling towns, bringing their gospel message and the reminder of civilization to people who had seen neither for a long time - if ever. And their appearance was surprisingly well received in these wild and lawless places more often than not - especially by the ladies of the area. The arrival of a Chapel Cars signaled not just the chance to attend Sunday services, but the arrival of someone to perform weddings, funerals, baptisms. It also provided a welcome excuse for social gatherings. In addition, many a rough and tough cowboy who would have balked at attending a traditional church, seemed to feel differently about these side rail services. In fact, the very novelty of the Chapel Car brought folks from miles around just to have a look. Of course, they didn’t always receive a warm welcome. There were instances of Chapel Cars being pelted with eggs and refuse, defaced with graffiti and even set on fire. But these were rare instances and the cars and their custodians survived to continue their mission. In actuality, the peace-minded missionaries who rode the rails played a larger part in bringing peace to the lawless west than any gun-toting lawman or vigilante. They traveled in their mobile churches to remote areas of the country, bringing spiritual direction and a civilizing influence to people who were starved for something to offset the violence and loneliness of their existence. Chapel cars remained in use on into the early twentieth century. With the advent of World War I, however, the railroad tracks had to be kept clear for troop movement. In addition, new regulations prohibited the railroad companies from giving ‘free rides’ to the Chapel Cars, something that had been common practice up until then. And as paved roads and automobiles became more common it was easier for people to travel on their own to attend church. Thus, the Chapel Cars that had brought their spiritual message and civilizing influence to the rough and tumble west faded into history. So, where is the most memorable place where you have attended a church service and what was it about it that made it memorable? I had never heard of a chapel car! I'll have to read more about these. I had heard of a tractor trailer set up and going from place to place. My most memorable place I've attended a church service is in the old brush arbors growing up. The roof would leak when it rained. They were a lot of fun though. Hi Sally - glad I was able to give you a new glimpse into our history today. And I've never heard of a brush arbor church, but it signs lovely - can you describe one for me? Winnie, I learned something this morning. That was really interesting. My hubby and I were in Italy right after the death of Pope John Paul. We went to mass there when the cardinals were there and they were choosing an new Pope. Interesting time to visit. Hi Debbie Lynn. Oh how fascinating to have been at the Vatican at such an historic moment! Winnie, I love the idea of a Chapel Car. This information was so interesting and I can just imagine the Chapel Car pulling into a little old west town ready to be an anchor for people needing hope and encouragement in their lives. Thank you for sharing! That is a piece of history I had never heard of! That was fascinating! There have been several somewhat unusual places I have attended a church service: one was in the Boys' Club of America building, back when my dad was starting a church; another was in a mission on Old Route 66, which was in a renovated motel; and when my family moved to Wyoming for my dad to pastor a church there, they were meeting in an old movie theater! Wherever services are held, it's always good to get together with God's people, and know He is present there! I loved learning this little piece of history! What a wonderful way to travel to remote areas sharing the Good News!! As a young girl, I remember visiting my grandparents and meeting in an old storefront while a new church building was being built. Winnie, this is so interesting! What a neat idea. I may have to put this in a story sometime. The most unusual place I attended a church service was on the bank of the Pecos River in New Mexico near where we lived. I was baptized there. Still remember the sight and sounds of those services. Hi Linda! And yes I had the same idea - this would make an interesting scene for just the right story! And oh what a special memory!! The modern day equivalent to this are the chapels in 18-wheeler trailers. These truck-stop chapels also travel around and then stay in a truck stop yard for a period of time. At one church where I attended, one of the outreach ministries was to the truck-stop ministry. Since my husband drove trucks the first twenty five years we were married, we loved volunteering there. Hi Lena - I didn't know about the 18-wheeler chapels. I can see where this is a direct modernization of train chapel cars. And how blessed that you and your husband were able to have a very personal involvement in this ministry. Hi Maxie. I've never attended a tent revival. Are they anything but I always pictured them to be like the Billy Graham revivals I used to watch on television, only on a smaller scale. Is that close or am I completely off base? My most memorable church service was an Easter Sunrise service in a very small, no longer used Catholic chapel. We took blankets in with us, it was so cold. Going outside after the mass, having donuts and juice, and watching the sun, wonderful. Hi Martha. That sounds like an absolutely wonderful memory. When I was a child we lived out a ways from town and my home church was also a chapel. I have very fond memories of the services there. So interesting, Winnie! Had never heard of chapel cars. The most memorable place I attended church services was in a large IMAX theatre, in which I was a cast member of a passion play about the life of Christ (in a tourist town). The play was conducted in the theatre every night, & on Sunday morning - church services were conducted there, & many of the tourists attended. The pastor started the play, as well as the church, & most cast members were members of the church. That building ministered to me every night through the play, & again on Sunday - through the pastor's sermons.